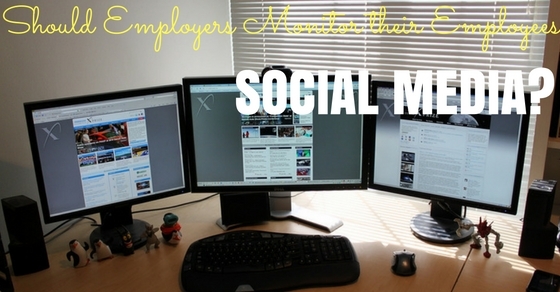 Should Employers Monitor their Employees Social Media? The web world has provided a virtual world in which practically everyone is living these days. The presence of social media like Facebook and Twitter has given the power to every individual to express their opinions about everything and anything under the sun. They even share the glimpses of their personal lives and thoughts going in their mind. The ease of virtual presence does bring the good and bad with them, personally and professionally. Even while hiring, employers do some background check of the virtual presence of the person. They tend to see what does their prospective candidate is doing in the online world. Even the arguments to companies monitoring their employees social media is still going on. People do post lot of personal things online for the world to see, but the concern for employers is if that is going to harm their company, in any case, they intend to dig into the person’s life to find anything which might not fit into an organization’s criteria. If the number of employees working in any organization are high, then monitoring their social media accounts is waste of time. If an employer intends to monitor the social media of each and every employee working then it is purely the waste of valuable time that an employer could have used somewhere else, leading to better benefits. People who are adept at using social media well, will ensure that they use strong privacy settings which will not allow companies to dig the information out, other possibilities are that the employer can create a fake account to mislead the companies for the information. While figuring out the right account and then going through is not the time worth that an organization should waste, but they need to put the same energy for the growth of their company and employees. The idea of controlling the lives of their employees is a dangerous idea. Companies should understand when to stop that control on their employees, social media is mostly an informal platform and a form of expression, where people express their ideas and feelings. Taking too much control can lead to harm the creativity of the employee as it will also affect their personal lives. A company needs to understand that creative people are the ones who bring growth in the company, also what an employee does after the office hours should be the concern for the organization. After office it is their own time. If any case, an employer finds something which might not be good for the company, then it is advisable to communicate it to the employees while hiring. There is a certain level of trust between employer and employee, when one of them is trying to enter in the other’s space it tends to break the trust. Therefore, an employer need to know where the boundaries of work and personal life begins and ends. Certainly, some boundaries are needed to be set in a place where the employer and employee are clear about the details and information to be posted. It is better to inform the employee of such activity of monitoring social media by the employer before so that a certain level of trust can be generated. If an organization is such who believes in interfering their employees’ life then it tends to generate a negative image of the company in the hiring market. The employees then find it difficult to put their faith in such company and the company may have trouble finding the right people for them to work. By allowing employees to live their lives, businesses proves that they accept their employees with their identity and the focus is only on their professional role. The company then sets the rules and regulations to be followed by the workforce for the benefit of the company without hampering the personal lives. Social media has become a source of inspiration too, where people from across the globes can talk without even meeting each other in person. They share ideas and thoughts. If anyone is stuck on an idea or looks for something to inspire then many people do tend to connect on social media to find the relevant ideas and answers. This way the work efficiency increases, instead of too much monitoring and curbing the creativity of their employees. Companies can arrange for the terms and conditions under which what are the things that can go online and what cannot with consequences. The creative employees can work and bring good ideas to the table for the company to grow. Social media is a good source of advertising and reaching out to people without any investments. Encourage your employees to advertise about the organization, the product or any offers, which can later help for something to go viral on the web and increase the popularity of the company. Hiring a separate agency to do this job will be an addition expenditure, and using the potential of your employees can bring more benefits than the loss. It is important for a company to understand how to use the positives of social media through their employees, rather than trying to curb them from using it or keeping too much of watchful eye on it. Rather than holding your employees back from social media usage, the positives of this can be used better. For example, by creating the Facebook page or Twitter account of the company, your employees can get an opportunity to meet and know the other people working in an organization. This will help in creating a better network and strengthen the company. People working in different cities can know each other through the official page, also if any new development in the company is happening or a news is to be shared, social media will be effective to share the news and keeping your employees up to date with the happenings within the organization. If your company is too intrusive in your employee’s lives, then this might lead to bad mouthing of the company on social media platform by the employee. No matter how much one tries to curb these practices but technology is smarter than this and people do find the ways to communicate their feelings, keeping in mind that the younger employees are the one dependent on social media. This may reflect a bad image of your company in the public’s eye. Because everyone has the basic right to freedom of expression. Sometimes a company needs to monitor social media activities, especially in the office. Many employees tend to spend too much amount of time on social media which in turn is the loss for company that is paying the employee to work. Occasional visit to social media is fine, but leaving all the work aside and spending time only on social media is not appreciated. Every employer expects the employee to work for the growth and benefit for the company and they ensure to pay good salaries and benefits to them, if then the results are not generated accordingly, then for the employer it is the money wasted. As it is important to allow employees to express their feelings online, it is equally important for an organization to keep up with their reputation too. Sometimes employees tend to say wrong things about an employer because of sheer anger or for some reason they do not go along with their managers. In long run, false allegations mentioned on social media can be harmful for an organization. Therefore, it becomes important to take timely measure to stop their employees from doing so. It is definitely not appreciable for the employer to peek too much what their employee is doing online, but a regulated monitoring becomes important whenever a company’s reputation is at stake. Occasionally or on rare instances, some employers might share confidential data or the organization online, which can hamper the company in various ways. Employers then require to keep a limited check on it so as to prevent such a case where an employer might share the data publicly. Maintaining the privacy of the company’s happenings are equally important for every employee and it is also a breach of trust from the employee’s side too. If any company finds some relevant data shared by the employee on social media then they can take relevant action against the employee. As the life on social media has become an integral part for everyone, therefore, it is important for the organization to officially put up the written rules even on social media. This will communicate the information to the prospective candidates as to what are the ethical codes expected from them by the employer. The written rules can mention the limited amount of monitoring that will happen and the consequences of, if someone is found breaking those rules. A clear picture will also put the boundaries on the employees from posting anything random or wrong about the organization online. Companies need to put down strict rules in thier social media policies to prevent the employees from posting anything which is confidential to the company in business or any financial developments. Also, to mention clear statements about the ownership of the various social media accounts of the company while working with the company. For example, someone handling company’s social media accounts might later portray as their own personal account. Therefore, in such cases, ownership clarity in rules will be of help later. A new trend has been observed where companies are asking the passwords of social media accounts of new joinees. This is the breach of trust by the company, passwords, and other codes are totally personal for any employee and they use it for their own benefit. Therefore, a company has no right to ask for the password. Here, ensure to mention this in the written statement while the candidate joins the company as in future, if an employee, tends to blame the company for the breach of privacy, then the employer has the written proof of it. Ensure to include social media rules during the training sessions of the new joinees and is shared with all the managers across the organization. The rules need to be communicated to the employees about the pitfalls of the misuse of social media especially with regards to the organization, the limited tracking that will be done to their own accounts. Or contacting with the competitors to share the confidential details may lead to strict action against them. The employer needs to ensure the safety of the company and meanwhile keep their employees happy, but in the process, a certain level of discipline is required to be maintained from both sides. Like any invention and technology that comes into existence, a boom of social media has also its positives and negatives. At one point it brings benefits to the companies and sometimes may hamper a company’s image, the effective usage if needed due to the fast developments that are happening in the world. An understanding is required to be build between employers and employees for a healthy long term relationship and any kind of bitterness is not good for both of them. More than 44% of companies do track the social media of their employees and about 71% of them has blocked social media usage in office hours. There could be many instances in which these rules might fail because social media platforms are yet to have their own substantial policies in effect because it is still a vague channel despite being popular. Previous articleWhat Tools and Techniques Do You Use to Keep Yourself Organized?